Charming Cozy Ocean Beach Cottage in San Diego offers accommodation with free WiFi 4.1 km from SeaWorld San Diego and 6 km from Old Town San Diego State Historic Park. Guests have a private terrace. The holiday home is equipped with 2 bedrooms a flat-screen TV with cable channels and a fully equipped kitchen that provides guests with a dishwasher an oven a washing machine a microwave and a toaster. The air-conditioned holiday home also features a bathroom with a bath or shower. The holiday home offers a barbecue. A terrace is available on site and both snorkelling and windsurfing can be enjoyed within close proximity of the property. 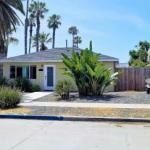 University of San Diego is 7 km from Charming Cozy Ocean Beach Cottage. San Diego International Airport is 5 km from the property.